Spring is upon us, and some of you may be getting anxious to get outdoors and do some landscaping and gardening. While it might not be quite warm enough to start your vegetable garden, did you know that you can start some of your plants indoors right now? Besides being fun, starting seeds indoors for plants such as tomatoes, peppers and eggplants is a great way to save money. Since these plants originate from countries with warm, sunny weather, they need a lot of extra time to grow. Hence the reason why you would buy these plants as transplants during the growing season here in Michigan. Seed starting kits do exist and they can be convenient, but expensive. These kits will come with several containers, a tray with lid, and starting soil. Cropped image. SITS Girls, Flickr. CC license. A growing medium is your seed starting “mix”. Your mix is fresh, sterile and contains fertilizer. It is not soil. You want to avoid using soil because it may contain weed seeds and insects, and can promote disease and fungus. Also, seedlings are very fragile and will require a light and fluffy medium that will also hold a lot of moisture. The mix will give your seedlings the best start for the season. Mix is commonly found and sold in bags, or as pellets of peat that expand when wet.Before you plant your seeds in the mix, make sure it is saturated with moisture. One easy way to do this is by combining the mix with water in a large bucket and scooping it out to fill your containers. Fill your containers to an inch below the top and settle the soil by tapping it against a hard surface. Do not pack the soil mix down. After you place your seed in your container of soil, you can add about ¼ inch of soil to the top. Don’t forget: 1 seed = 1 plant. Containers come in many different shapes and varieties. Common containers include plastic pots and flats, as well as peat pots. To save money, you can use some items that you may have around the house. Yogurt cups or any other small containers are great options; just be sure to sanitize them with a 1:10 ratio of bleach to water before use. You will also need to drill small holes in the bottom to allow for drainage.Some containers will break down in the soil, so you can plant the entire pot and plant together, avoiding disruption of the root system and further weakening your plant. These are usually shaped as compressed peat, or you can DIY your own using newspaper. Keep in mind that your container only needs to be about 3 to 4 inches across.The last component you will is a tray to hold your containers. The tray is not only used to collect water but also for watering (I’ll touch on this in a bit). You will need to do a little research before you get started. You will need to determine how soon you can plant your seeds indoors. The best place to find this information is on the back of your seed packet. Some packets will tell you a good month, while others will tell you a good time. For most of metro Detroit, our last frost date is approximately May 29. So if the seed packet gives you a time, let’s say “4 to 6 weeks before last frost date,” you will have to count back the weeks to determine when to start indoors. In this example, that would be the first to third week of April. If you happen to have some window space, your transplants will need a good south-facing window. Second best would be an east- or west-facing window. Don’t place your plants near a window before germination has begun (germination is the time period between seed to sprout); the cold night air can affect germination rates. Plants such as peppers and tomatoes require 80 to 85 degrees Fahrenheit to get germination started.Until they germinate, they won’t need the direct sunlight; the only thing they require is warmth. To gently warm the soil, place your tray on top of a refrigerator, dryer or another heat source such as a waterproof heating pad. Once your seeds germinate and the sprouts reach one-half inch, you can remove the heat source and place the seeds near your sunny window. Be sure that the temperature in that area stays between at least 60 to 70 degrees Fahrenheit.For optimum results, consider investing in a fluorescent light source to ensure that the seedlings are getting enough light. Make sure the light is placed close to the plants, about 4 to 6 inches away. Keep in mind that you may need to adjust the height of your light source as your plant begins to grow. From the moment you plant your seed until germination, use a spray bottle on a fine mist setting to dampen the soil. Place the plastic cover (or a sheet of plastic, plastic bag, etc.) over the top of the container to maintain moisture and humidity.Once your seeds sprout, keep the cover off and water the seedlings from the bottom. This is done by pouring water into the tray that your containers are sitting in. You should avoid watering the soil from the top of the container. This could damage or displace your seedling, as well as increase the chances for plant diseases. It isn’t a bad idea to have a gentle, light breeze blowing air in between the plants to eliminate excess moisture and humidity. You may have noticed that some local grocery and home improvement stores have started stocking their seasonal aisle with seeds and gardening supplies. Nurseries that are open for the season will also have seeds available for purchase. Don’t hesitate to look online for a wider variety too! When the weather has been consistently 50 degrees Fahrenheit or above during the night, it is time to “harden off” your plants to get them ready to be planted. So what does “hardening off” mean? Hardening off is a process that consists of slowing acclimating your plants to the outdoor conditions they will need to be accustomed to. If you don’t harden them off, they will die. But don’t worry! This step is easy to do. Take your plants outside and place them in a shady spot for 2 or 3 hours a day at first, then gradually increase the time until they are outside for a full day. Introduce them to sunlight in the morning first, then all day long. This process should only take about a week. It’s always better to plant later than too soon, so don’t feel that you have to plant them in one week if they don’t seem strong enough. When you are ready to plant them in your garden, do so in the evening when the sun isn’t as intense, and be sure to keep them well watered. After that, keep an eye on your garden just as you would normally do. Before you know it, you’ll have big, juicy tomatoes and lots of hot peppers that are ready to be harvested! – Joohi Castelvetere is a nutrition and food scientist and a mother to three amazing children. She’s also a Parenting Program volunteer. Cropped image. Mad Mod Smith, Flickr. CC License. Now that you know a bit more about Square Foot Gardening (SFG), let’s end this three-part series on the topic of planting. It’s certainly not too late to start planting in Michigan. In fact, depending where you are, you might not have been able to plant any warm weather crops until this month. One handy map is the interactive USDA Hardiness Zone Map where you can enter your zip code and find out which zone you are in. This helps you determine what you can plant at any time of the year. For example – I live in Macomb, Mich. so I enter my zip code of “48044” and the map determines that I live in zone “6a.” Now I can use this information to find out which month of the growing season is appropriate for my seeds or transplants to be planted. Another useful tool is finding your “last frost date.” At Dave’s Garden you can enter your zip code and find out which date is your predicted last frost date. If you’re planting warm weather crops like tomatoes, peppers, eggplant, and basil, you want to make sure you put them out when the possibility of a frost is gone. For Macomb, Mich. this date was May 15, 2015, but it varies all over Michigan and the United States. Beds assembled? Filled with Mel’s Mix? Grids in place? Trellis up? If you answered “yes” to all of those, then you’re ready to plant! Let’s cover the basics of planting and how SFG is different from traditional row gardening. I made a planting chart (see below or download a PDF) that will hopefully come in handy for some of you. It’s by no means inclusive of all the different types of plants you can put in your SFG, but it’s a good start. For most plants you can buy seeds, transplants, or both. For most gardeners, it’s a personal choice, but transplants can be expensive and most plants have time to grow from seed. I know that those transplants are tempting! They give you the visual satisfaction that your garden is actually growing something. Interestingly enough, I compared the time it takes for plants to harvest from seed vs. transplant. By the time you can plant your transplant, your seeds will have already sprouted to the same size as the transplant. Furthermore, it’s cheaper to grow from seed. OK, back to the planting chart. I indicated which option is best by shadowing that option in “pea” green (sorry, I couldn’t help myself!). Some plants like tomatoes, peppers and eggplants will need to be transplants because they don’t have enough time to grow to maturity from seed outdoors. You could start the transplants indoors, but you would need to this in the late winter/early spring months, such as February and March. Just be sure to “harden off” your plants before putting them out in your garden and out in the elements. “Hardening off” is a process by which you slowly get your new transplants used to being outside. You can learn more about it here. Some plants including asparagus, potatoes, garlic and bulb onions come as “sets”, “tubers”, or “seed potatoes”. Asparagus is a perennial crop that will come back every year, but won’t produce for two to four years. This vegetable will also spread and produce more shoots year after year. Potatoes will come as “seed potatoes” from the store, or you can start your own from potatoes at home. Just remember, potatoes require 12” of soil so unless your SFG box is resting on top of your existing soil, you will need to make a top hat so that the potatoes have room to grow. You can reference the large chart above to determine how many seeds or plants per square. If the plant you’re planting isn’t listed, you can determine spacing based on what the back of the seed packet says. And wouldn’t you know … I made a guide for that as well (see below or download a PDF)! The only exceptions to the spacing rule on the back of seed packets are for melons, cucumbers and pumpkins . Since these vegetables grow on vines they need lots of space. Even though you are using a trellis for these plants, the leaves need lots of space for airflow, which is essential for disease prevention. So be sure to follow the “two per square rule for cucumbers” and the “one per two squares” for melons, pumpkins, and squash. Each seed has an optimal planting depth. There’s no need to bring a ruler out with you when planting, just estimate the depth using your finger. A good rule of thumb (or finger in this case) is to remember that the first knuckle of your index finger is 1 inch. The second knuckle is 2 inches. The third is 3 inches. Anything less than an inch can be estimated with a poke in the soil. If you have your children or grandchildren helping you (which you should, because gardening is fun for all ages), you’ll need to adjust for their fingers (e.g., the second knuckle on my kids is 1 inch). Make sure you loosen up the soil with your hands or trowel before making the holes. Once you have the soil lose and the holes made, you can put in your seeds. I recommend having one “seed hand” and one “hole making hand”. When you come across the teeny tiny seeds like carrots and lettuce, they will stick to your fingers if they have dirt on them. When you have 16 holes to fill with tiny lettuce seeds, you can imagine your patience (and seeds) going out the window! Please also keep in mind that one seed will give you one plant. This is one reason why SFGs are much more efficient than traditional row gardens. You don’t need to sow an entire row of seeds, and then come back to thin out the seedlings. Another benefit of SFG is that you are saving money by planting one seed! A package of lettuce seeds contains thousands of seeds. That’s thousands of lettuce plants for $1! What a deal! For the easy to manage large to small seeds, you only need to plant one. I plant two just in case one doesn’t germinate. For the tiny seeds, a small pinch (usually about three or five seeds) will do. Once your seeds are placed in their new homes, loosely cover them with soil. Don’t pack it down. You want small amounts of light and water to be able to make it down and you want the new seedling to be able to emerge easily. The last thing you need to do is water your newly planted seeds and/or transplants. Make sure you water the seeds consistently for two weeks. When watering transplants and your new seedlings, be sure to water at the base of the plant. The most painful part of SFGing is pinching off or cutting the extra seedlings that sprout. In most cases all the seeds that you placed in one hole will germinate and you will have several seedlings where only one should be. I’ve experienced this countless times. I head outside to see my beautiful little seedlings coming up to say “hello”, only to realize that now I must make the hardest decision of the growing season — which one gets to live and which one must die. I know it sounds silly, but you wait until it happens. You may try to bargain with yourself and think, “Maybe I can transplant this little guy somewhere else?” or “Let’s just see what happens if I let him grow.” No, don’t do it. You must either take your small scissors and clip the extra seedling at the base, or pinch it off with your fingers. It’s for the best, as your other seedling will need to grow big and strong and turn into a high yielding, bountiful plant. Other maintenance besides watering will be keeping an eye on any little weeds that grow from seeds being blown in. Weeds will be easy to find because you will know that you didn’t plant something in that spot, or simply because it doesn’t look like the other plants. Since the Mel’s mix is so loose, the weeds will come right out. As I mentioned in my prior post, there’s no need for fertilizing, but you can if you choose. It can be in the form of top dressing with compost, or adding bone meal, blood meal, etc. For example I like to spray my pepper plants with Epsom salt solution because it gives them a little extra nutrients that they need. It’s not necessary, but I’ve learned little tricks to give certain plants that extra boost. Most plants will continue to produce as long as you keep picking their fruit. Indeterminate tomatoes are good for trellising because they will grow as tall as you let them and they will keep bearing fruit. Some plants, like peas, will continue to grow and flower but stop when the weather gets too warm. There is no need to wait for lettuce to grow into a giant head. You can harvest the outside leaves and the plant will continue to grow. Our lettuce gets about waist high before it gets too hot and bolts (“bolt” refers to when the plant goes to seed and is no longer edible.) Some greens like kale continue to grow all year, even in the winter, as long as you harvest the outside leaves and let the inside grow. Broccoli is another great example. Once you cut off the main head, the stem will bear new florets that you can harvest throughout the year. I hope I inspired many of you to try square foot gardening. Always keep in mind gardening is a learning process that we obtain through trial and error. I’ve had an amazing garden that seemed to produce endless amounts of produce and I’ve had years where my entire garden failed. You will constantly be learning. You’ll also become a Google-certified entomologist from all the research you will do to determine which insects are eating your plants. Have fun with it! And remember there are communities of people who are either first timers or experts in SFG, so don’t hesitate to reach out to others for help. Thank you so much for your interest. – Joohi Castelvetere is a nutrition and food science major at Wayne State University, a mother of three amazing children, and a certified Square Foot Gardening instructor. She’s also a Parenting Program volunteer. One Small Box For One Giant Harvest of Good Eats! Kirsten Badertscher planted this SFG with the help of her 2- and 4-year-old children. Building your own square foot garden (SFG) can be a rewarding experience for anyone, especially people and families looking to have a little more control over the foods they eat. Selecting your crops can be fun and exciting. It’s also a great way to try some new foods you are curious about. Plants grown in a SFG don’t require the use of pesticides and herbicides either, so there’s no worry about potentially harmful effects of added chemicals. While putting together your SFG might seem laborious at first, it’s something you will only need to do once, and it can be a very rewarding experience for all involved. No one ever said gardening was easy, but you will be pleasantly surprised by how effortless square foot gardening is and how fun it is. May is a great time to begin constructing your SFG. In Michigan, you’ll be able to plant almost any weather crop. From lettuce to radishes, and tomatoes to eggplant, your possibilities are endless. First you need to decide on the size and style of your raised bed. Your SFG can be placed directly on top of existing soils, built to sit on top of concrete, or can be elevated on legs. Kathrine L. Jarvis used cinder blocks for her SFG. Image source: Katherine L. Jarvis. If you’re interested in a more complex design, there are numerous resources available online and on Pinterest. Today we will focus on the most simple of designs: the basic SFG. To start, we will begin with the list of materials needed for this project. Cedar is one of the best options for building your SFG box. Cedar wood is naturally disease- and rot-resistant. This means that the wood isn’t chemically treated. The only downside is price. Mel Bartholomew, the founder of the Square Foot Gardening Foundation, believes that when building a SFG, you should use whatever materials you have available, and to use resources that are affordable. Personally, I’ve seen boxes made of cinder blocks, composite decking, leftover lumber from construction companies, etc. Use whatever materials work for you, and try to save money where you can. SFGs use a special type of soil called Mel’s Mix. This soil mix is essential and one of the reasons why SFG is so simple. You only need three ingredients for the mix: peat moss, coarse vermiculite, and a variety of compost. You mix these three components in equal parts (⅓+⅓+⅓) and the amount you need (in cubic feet) depends on the dimensions of your box. For example, if you have a 4-by-4-foot box, you need a total of 8 cubic feet of all three components. If you round up to 9 cubic feet, the math is a little easier and you can split each component up. This means you will need 3 cubic feet each of peat moss, vermiculite, and compost. To calculate the required amount of soil, you simply take the dimensions of your box and multiply them together. So for a 4-by-4-foot box, you will multiple 4 feet by 4 feet by .5 foot. (since your box is only 6 inches deep, you will multiply by ½ a foot). You need to be careful, however! Peat moss is usually sold in a compacted form, so if you purchase a 3-ft3 brick, you will actually have 6-ft3 once it is fluffed out. Be sure to take that conversion into consideration when purchasing your supplies. You also need to be sure to buy the ‘’coarse’’ grade vermiculite, which will keep the soil loose, and help hold more water than the finer grades. Lastly, be sure to buy a variety of composts, such as chicken, cow, mushroom, etc. Having different sources makes a more nutrient-rich blend that will do a better job of fertilizing your plants. I suggest five different sources, but that can be hard, so do the best you can at finding a variety. With SFGing you’ll also use vertical space to maximize any available space you have. Plants such as tomatoes, peas, beans, melons, cucumbers and pumpkins can all be grown vertically! SFG made of composite deck material. Trellis made from ½’’ PVC. I prefer a 6 feet tall trellis that is around 4 feet wide. This allows my plants to grow high, without being too high for me to reach. If you are handy, you may use any available materials to design and build your own trellis. Our family uses electrical conduit that you can pick up from any home improvement store (ours measures ½-inch in diameter). The conduit comes in a 10 foot length, so it works out great if you need to cut in those dimensions! Next, add two elbow connectors at the ends and you have a trellis frame. You can secure the bottom by placing the frame over metal rebar that is fixed into the ground, or you can secure the conduit with clamps that are screwed into the sides of the SFG box. Once you have your trellis assembled, you can ziptie on trellis netting that can also be purchased at many garden or home improvement stores. This is one of the most important components of your SFG. Grids need to be permanent and prominent. This is where the term ‟square foot’’ in ‟square foot gardening’’ comes from. Each square will be 1 square foot, and will be your guide for determining not only what you plant, but how much to plant in each square. This SFG has a nicely laid-out grid, along with chicken wire on top to deter hungry critters. Image source: Dave Werth, Sr.
A traditional SFG grid is made up of wood lath that is placed both horizontally and vertically across the frame of your SFG. The ends should secure directly into the frame using small screws or nails. If you have trouble finding wood lathe, you may also use twine. In our beds, I placed nails so that they stick up like pegs, to which I then wrap twine around and make into a grid. Again, find something that works for you, but the best grid will be something sturdy! You may need additional tools once you start your SFG. Luckily, many of you will already have these items on hand! Pencil. When planting your seeds a pencil comes in handy for poking holes into the soil. A finger or two always works great too! Small scissors. The kind used by elementary students work well. When planting seeds, you’ll want to be sure to cut back any extra seedlings that emerge. Thanks to my amazing friends over at the Square Foot Gardening Facebook page, I was able to provide everyone with some amazing examples of SFGs done in a number of ways. Feel free to join the group if you decide to embark on this amazing gardening adventure, or just want more information. My next post will focus on planting seeds and transplants. If you decide that you don’t want to wait, go ahead and grab a copy of the All New Square Foot Gardening book, which is the best source of information on building, planting and more. I’m also available for any additional questions! – Joohi Schrader is a nutrition and food science major at Wayne State University, a mother of three amazing children, and a certified Square Foot Gardening instructor. She’s also a Parenting Program volunteer. Are you a gardener? If not, have you considered starting your own garden but aren’t sure how? If you do garden, what do you like most about it? However many of us may feel intimidated by starting our own vegetable or flower garden for various reasons. If you’re like my family, you may live in a subdivision where you don’t have a lot of room to plant. Some people experience a lot of shade on their property, or may live in an apartment with only a small outdoor deck space. Gardening seems like a lot of work too. Trying to balance soil pH, nutrients, as well as using big equipment to turn up soil every year sounds daunting. But I’m here to tell you that no matter where you live you can start your own garden and it’s easy! Last summer I wrote a blog post about how parents can use gardening to encourage their children to try new, healthy foods. In that post I mentioned a technique called “square foot gardening” (SFG). Our family has used this method for four successful years now. With the weather beginning to warm up, now is a great time to learn a little more about this method, and possibly build your own bed. You can plant almost anything, anywhere. These beds are “raised”, which means you plant above the existing soil. Ninety percent of the plants grown only require 6 inches of soil, so you can add a bottom to your SFG and place it on a deck or concrete patio. There’s also the option to add legs to the bed, making it more accessible to those who may have a disability, or to simply make gardening easy on the back. If your yard is mostly in the shade, you can still garden and grow plants that require very little sun. A SFG can be any size — a 2×3, 2×8, 4×4, 4×8, etc. —and made to fit where ever you’d like to place them. They also look nice so you can put them anywhere, even the front yard. If they have a bottom and/or legs, you can move them around if need be. You don’t need to use any chemicals. There’s no need to add chemical fertilizers, pesticides or soil amendments because with SAG, you make a special soil called “Mel’s Mix”, which is equal parts compost, peat moss, and coarse vermiculite. Your compost should come from various sources (chicken, mushroom, cow, your own, etc.) and provides the nutrients that your plants need to grow and thrive. Peat moss and coarse vermiculite help keep the soil moist and loose. You won’t need to rototill your SFG either; even after the winter the soil is still loose. The only tools you will need are a small trowel, small scissors and a pencil. Once you harvest a square, you simply add one scoop of compost and plant another set of seeds, or transplant. Yes, it’s that easy! This method also reduces the need for any chemical pesticides. The types of plants you put in each square are staggered, so you aren’t planting too many of the same type of vegetable. Insect pests don’t like to work for their food, so if you only have one broccoli next to some lettuce, you don’t have to worry about an entire crop of broccoli being overtaken by caterpillars. If you do notice some insects, there are organic methods to rid your garden of them. I always keep some neem oil and diatomaceous earth on hand in case I have a rare issue with bugs. Grow more in less space. SFG uses 1×1 foot squares for planting. For example, in one square you can plant 16 carrots, radishes, or green onions; nine beans, peas, spinach or red onions; four heads of romaine lettuce, or basil; and one tomato, pepper or eggplant. You can grow almost anything in a SFG. In our SFGs we have trellises that are 6 feet tall. On those trellises we grow tomatoes (have you ever had a tomato plant reach over 6 feet tall? ), pumpkins, watermelons, peas, beans, cantaloupe, cucumbers and squash. If you consider the plants you can grow up, you use even less space. When you think of a traditional row garden, think about all the space it takes up. Almost half of that space is just being walked on to get to your produce. With a SFG, you efficiently use space. 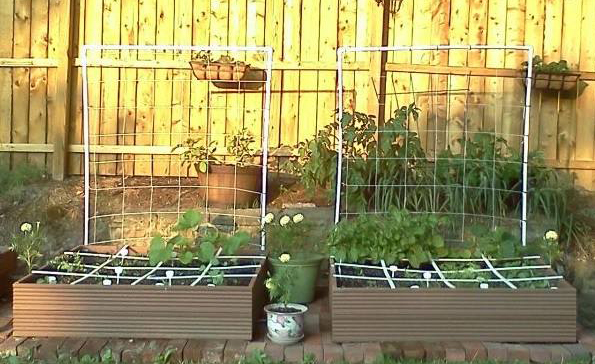 Imagine how much room you would need to grow all of those items in a traditional row garden! Here is an example of a 4×4 garden layout. No weeding and less watering. Since the soil mix contains coarse vermiculite and peat moss, you eliminate the need to weed and avoid overwatering. You also don’t need to worry about plants drying out if you forget to water them. Most likely some seeds from various weeds will blow into your garden, but since you are planting seeds or plants in a specific place inside of your square, you can pick the weeds out easily. It’s fun, easy and great for families! Gardening should be something that we find fun and relaxing. With SFGs there’s little work and effort involved, and it’s something you can get the whole family in on. Whether you have kids, grandkids, nieces/nephews, it’s a great way to teach and encourage healthy eating, as well as making lasting memories. SFG is a very simple concept and a great way to try gardening. In fact, I’ve met people who’ve done traditional row gardening for over a decade, then switched to a SFG and found it much more efficient and easier. Lastly, I would like to share a video on the 10 basics of SFG. I made it last year while I was becoming a certified instructor. To learn even more about SFG, visit The Square Foot Gardening Foundation or read “The All New Square Foot Gardening Book” by Mel Bartholomew. This book features tons of information such as how to build a bed, make Mel’s mix, planting guides, etc. I hope I’ve inspired you to start your own SFG. If you have any questions I am more than happy to answer them! Please keep a look out for my next post on this SFG series where I will show you step-by-step on how to make your beds and how/when to plant certain vegetables. It’s fun seeing our plants grow from tiny seeds. Remember the days when trying a new food with your baby was as simple as opening a jar? Those chubby cheeks would squeal with delight when a spoonful of squash or peas landed right on their taste buds. Once your children are old enough to tell you they don’t want to try the green beans, or push their plate away because they can see tomatoes in the spaghetti sauce, you may be wondering where your once-adventurous eater went! A really fun way to get your kids curious about fruits and vegetables is to help them to grow their own. 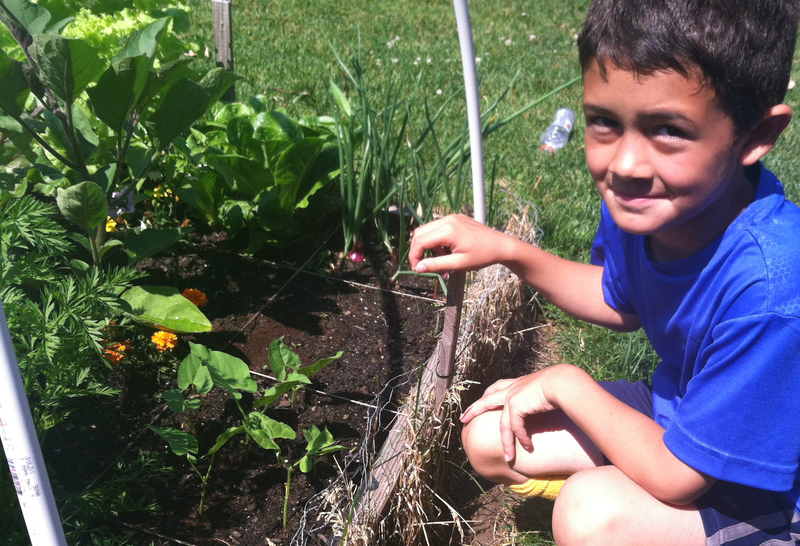 I found great success in getting my children to try new foods when we garden as a family. You can do this whether you have a garden at home or simply have some patio pots lying around. There are a lot of vegetables that can be grown in containers big or small: lettuces, mini carrots, radishes, green onions, beets, beans, peas, potatoes, and even zucchini. There may not be a lot of time left to grow some of the plants, but in July, you can certainly try to grow radishes, lettuces, cucumbers, beans, and some others from seed. If you aren’t sure what you can grow, check the back of the seed packet as a guide. Some plants really enjoy the shade, so know that you are not limited to the amount of sunlight your plants receive! A good way to start is to plant one seed, remembering that you’ll get one plant per seed. In some cases, you can plant two seeds to make sure one of them germinates. If they both sprout, just snip off the weaker one with some scissors. For really tiny seeds, like lettuce and carrot seeds, a pinch will do. Again, snip off the weaker sprouts. Also, be sure to note the “planting depth” on the back of the seed packet. As you will see, the plants go through stages as they grow. Even as a tender seedling it’s hard to tell which plant it will turn into. Once the plant is ready, have your kids harvest it and clean it off. Work together as a family to look up some interesting recipes and chose one that they like. You’ll be surprised at how much more enthusiastic kids will be when trying new foods if they get to decide! Another idea is to find an age-appropriate preparation or cooking task for them to get them involved. Keeping them involved from seed to table is a great way to encourage what I like to call “adventurous eating” (seriously, what kid doesn’t love the word “adventure”?). Match the Seed to Its Plant: Make a grid on some paper, or put seeds in a baggie and try to have the kids guess what the seed will turn into when you plant it. The kids love to feel the seeds and try to guess. Even I was surprised at first! Guess the Seedling to Its Plant: This works if you planted a variety of seeds. To keep the fun going, pick up some note pads, or make your own mini research notebook. Have your child draw the seed, then the seedling, and keep notes as it grows. What do the leaves look like? Is the stem fuzzy, smooth, prickly? What do the flowers look like? And finally, what grew? Here’s my setup for the “Match the Seed to Its Plant” game. You may not turn that picky eater into a foodie over night, but this is a great way to make healthy eating fun. Before you know it, you’ll have fewer plates pushed away at dinner and more children asking you to make that bean dish again!